I didn't grow up celebrating Valentine's day. Should I even attempt the stereotypical sentence that Paris is romantic every day of the year and that we don't need a special day to celebrate love? I wouldn't dare. But the truth is, it's not a day of the year we that we're particularly attached to in France. Or at least not a day that really marked my young teenage years. I see a lot more marketing around the holiday when I go back to France now, but while I was in high school I saw it as a North American celebration that you really only understand from cheesy American movies. Now that I live on this side of the world, I've got to admit, I have a love/hate relationship with it. Yes, it really is a consumer-driven holiday. The cards, the chocolate, the teddy bears, the teddy bears made of chocolate, the hearts, the flowers - is that really what we are waiting to receive? That part isn't really enticing to me in any way. However, the love part I'm all for. Although I don't believe in set days to remember to show affection, I will never say no to an added day of the year that's about a little bit of giddiness. To mark the occasion, I've got an an easy update on a classic. Deliciously sweet brownies, all-dressed up for Valentine's Day! I like to use the Baked brownies (my all-time favourite! 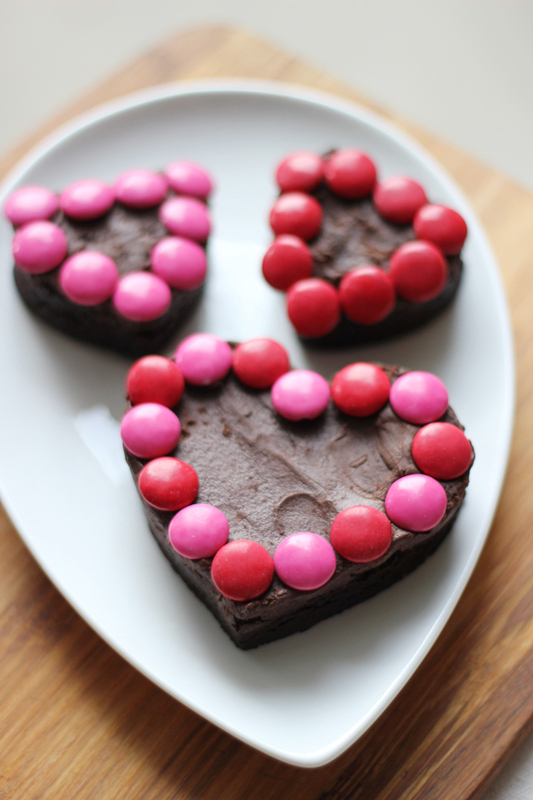 ), cut the cooled brownies with a heart-shaped cookie cutter and add a few decorative Smarties. Aww they are so cute!! Your heart-shaped brownies with a colourful trim are delightful. Juanita: Thank you! We could all use a little more giddiness year-round so it's nice to set a day aside for it. These are so cute. I can't think of anything I'd rather eat on Valentine's Day than a delicious chocolate brownie. thelittleloaf: I couldn't agree more! So simple yet so perfect for a delicious Valentine's treat! Nice looking & it will be tasty. Chocolate is all time favourite of almost everyone. It is not necesary that we must have it on valentine but we can make it anytime. Thanks for this yummy sharing. i don't like the idea of celebrating valentine's day, at least not in the commercial and contrived sense, but, all that lovely sugar and chocolate is compelling!